A pictograph from the Codex Mendoza showing the founding of Tenochtitlan. Tenochtitlan, the populous lake city of the Mexicas in the 14th and 15th centuries, has always fascinated me. And much of that fascination has to do with the story of the city's founding, memorialized in the dramatic, aggressive image of an eagle perched on a prickly pear cactus, and a serpent wriggling in the grip of its talons and beak. "The Mexicas [one of the three groups that formed the Triple Alliance in the 14th century, in the region around what is Mexico City today] fled to a swampy, uninhabited island" on Lake Texcoco. "According to an account by Hernando Alvaro Tezozomoc, grandson of the last Mexica ruler, the refugees stumbled about the island for days, looking for food and a place to settle, until one of the priests had a vision in a dream. In the dream, the Mexica's patron deity instructed his people to look in the swamp for a cactus. 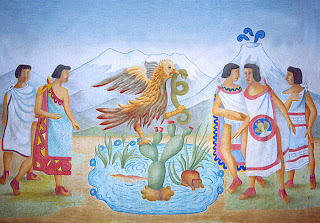 Standing on the cactus [the prickly pear cactus, called the tenochtli, which inspired the name of the town], the god promised, 'you shall see an eagle, warming itself in the sun.'" 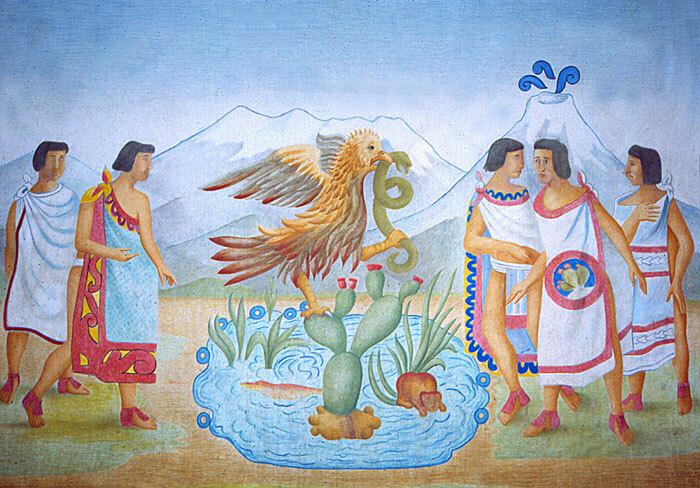 "It was prophesied that they [the Mexicas] must settle 'where the eagle screeches, where he spreads his wings, where the eagle feeds, where the fish fly, where the serpent is torn apart.' In the distance, on a prickly pear cactus, they saw this vision, of an eagle eating a snake. A voice cried out: 'O Mexicas, it shall be here!' But no one knew who spoke. They knew that the reedy but defensible islands in the middle of the lake should be their home, Tenochtitlan, 'place of the prickly pear'. It was the year ome calli, '2 House', 1325." "Tenochtitlan dazzled its invaders - it was bigger than Paris, Europe's greatest metropolis. The Spaniards gaped like yokels at the wide streets, ornately carved buildings, and markets bright from goods from hundreds of miles away. Boats flitted like butterflies around the three grand causeways that linked Tenochtitlan to the mainland. Long aqueducts conveyed water from the distant mountains across the lake and into the city. Even more astounding than the great temples and the immense banners and colorful promenades were the botanical gardens - none existed in Europe. The same novelty attended the force of a thousand men that kept the crowded streets immaculate." The Mexico City of today is built over the ruins of the lake city (the lake is now drained) of Tenochtitlan. 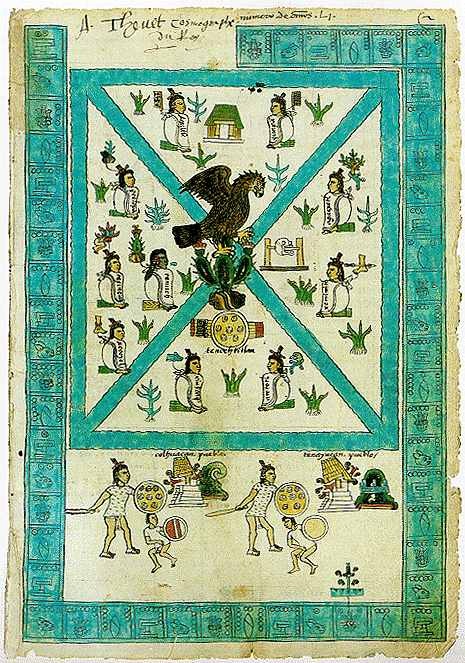 And the image that guided the Mexicas to build the city now occupies a central place in the flag of Mexico.